Joel Spencer: Faith Bible Church, Warren, Pa.
Luke 1:39-56 This week Joel Spencer brings us a special Christmas message, as we take a look at Mary’s song. Click below to listen to this inspiring sermon. 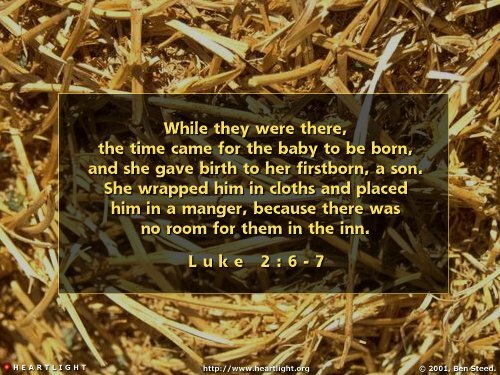 Luke 2:6-7 Today Pastor Ron finishes his series, “The Birth of Jesus Christ.” This time we look at his humble birth. We learn how God came down to earth in the form of a little baby to save us from the penalty of sin. We also see why the virgin birth is so important. God had a plan and gave us a wonderful gift. 1. While they were there, the days were completed for her to give birth. 4. and laid HIm in a manger, because there was no room for them in the inn. Please click to listen to this wonderful sermon. Luke 2:4-5 This week Pastor Ron continues his series, “The Birth of Jesus Christ.” He shows us Joseph and Mary on their way to Bethlehem to register for the census. This week Pastor Ron begins a Christmas series called “The Birth of Jesus Christ.” He begins by taking us to Luke 2:1-3 where we find Caesar Augustus making a decree that a census be taken of all the people in the Roman Empire. God works out the details so that prophesy might be fulfilled. 2. a decree went out form Caesar Augustus that a census be taken of all the inhabited earth. 3. This was the first census taken while Quirinius was governor of Syria. 4. And everyone was on his way to register for the census, each to his own city. Please click below to listen to this wonderful Christmas message. 1 Samuel 2, 3, 4 This Father’s Day, Pastor Ron takes us inside the family of Eli to see what were the characteristics of this ungodly father. Eli should not be our example of fatherhood. 1. Eli demonstrated a lack of ________________________. 2. Eli neglected his responsibility to ___________________. 3. Eli modeled unfaithfulness in his ___________________. 4. Eli showed disregard for the ______________________. On this Mother’s Day, Pastor Ron explains to us how Hannah was a godly mother. She had very serious trials in her marriage to Elkanah, but her faith brought her through it. We can learn a lot from her example. Please click on the link below to listen to this inspiring sermon. 1 Timothy 3:14-16 In this week’s Easter message Pastor Ron helps us understand how the resurrected Christ can Transform our lives. f. Taken up in glory.